28 “Oh, Patti, what would we do without the Treasure of our Faith! ... Our Lord asks each one of us to pick up our cross and follow Him. He will go before us to open the Gates of Heaven after we have been purified in Purgatory. Our Faith tells us that we will meet again in Heaven. 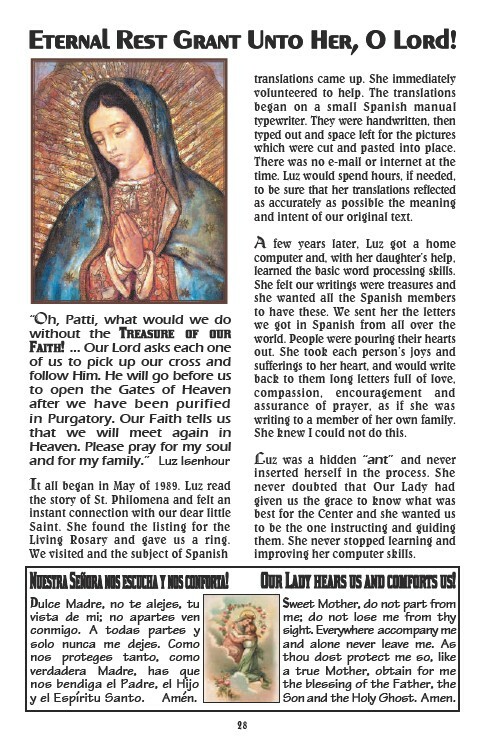 Please pray for my soul and for my family.” Luz Isenhour It all began in May of 1989. Luz read the story of St. Philomena and felt an instant connection with our dear little Saint. She found the listing for the Living Rosary and gave us a ring. We visited and the subject of Spanish translations came up. She immediately volunteered to help. The translations began on a small Spanish manual typewriter. They were handwritten, then typed out and space left for the pictures which were cut and pasted into place. There was no e-mail or internet at the time. Luz would spend hours, if needed, to be sure that her translations reflected as accurately as possible the meaning and intent of our original text. A few years later, Luz got a home computer and, with her daughter’s help, learned the basic word processing skills. She felt our writings were treasures and she wanted all the Spanish members to have these. We sent her the letters we got in Spanish from all over the world. People were pouring their hearts out. She took each person’s joys and sufferings to her heart, and would write back to them long letters full of love, compassion, encouragement and assurance of prayer, as if she was writing to a member of her own family. She knew I could not do this. Luz was a hidden “ant” and never inserted herself in the process. She never doubted that Our Lady had given us the grace to know what was best for the Center and she wanted us to be the one instructing and guiding them. She never stopped learning and improving her computer skills. Dulce Madre, no te alejes, tu vista de mi; no apartes ven conmigo. A todas partes y solo nunca me dejes. Como nos proteges tanto, como verdadera Madre, has que nos bendiga el Padre, el Hijo y el Espíritu Santo. Amén. Sweet Mother, do not part from me; do not lose me from thy sight. Everywhere accompany me and alone never leave me. As thou dost protect me so, like a true Mother, obtain for me the blessing of the Father, the Son and the Holy Ghost. Amen.